And a fun one. I got to go to puppy camp or daycare as Dad calls it for a few days since Dad had a big job. I was excited since there were 2 dogs there that looked just like me – imagine that! 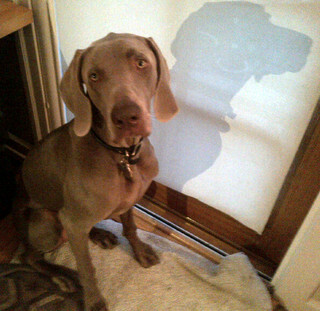 I do not know any Weimaraner’s so that was a treat and we played all day till I got picked up. Mom’s office is almost done and I can’t wait to go visit since, after all, I am in the lease. Mom said I have to mind my peas and carrots before I’m allowed. Lori took me for a walk today and gave me a good report card – I’m waiting better, heeling more and in general a better dog. Mom and Dad had their doubts but something shifted inside me this week and maybe I’m ready to behave more often. I tend to be a bit moody so it depends on the day but I’m trying to be a good Santa Monica citizen. Here’s me waiting patiently to go outside so you can see what I’m talking about….